As the Arab world rumbles and shakes, women in the region are experiencing the good, the bad and the ugly that comes with instability, transition and crisis. From Tunisia and Egypt to Syria, Libya and Bahrain, women have been present and vocal in the street protest movements, standing shoulder to shoulder with the men, resisting the batons and tear gas, and being killed. While they made major gains in education and civil rights in the 1950s and 60s, Middle Eastern women were marginalized from politics and decision-making throughout recent decades. The current transition period does not bode well either. The political developments and status of women differ across countries. 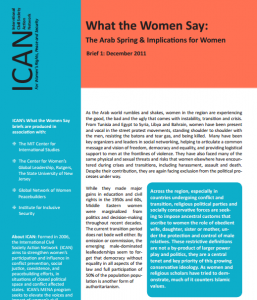 In the first of ICAN’s What theWomen Say; MENA Region briefs, we highlight common regional trends that threaten basic norms of democracy, equality and affect women’s abilities to participate in and influence the decision-making processes – nationally and internationally – that will determine the course of these countries’ futures and their lives.